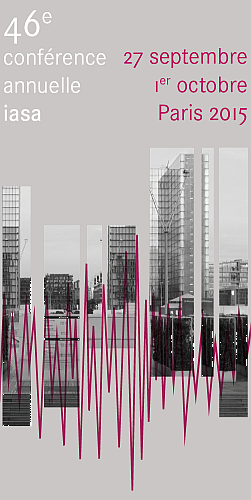 The International Association of Sound and Audiovisual Archives (IASA) announces its 2015 annual conference to be hosted 27 September through 1 October at the Bibliothèque nationale de France, in "La Ville-Lumière", Paris, France. IASA welcomes all who manage and care for the world's sound and audiovisual heritage to come together in Paris, the enchanting city of light, where we will explore innovative and tested solutions to contemporary issues that face us all. All for One — One for All: Common Concerns — Shared Solutions. The programme will include Papers, Tutorials and Practical Workshops. ...and then, we urge you to stay one more day in Paris for the first ever, Europeana Sounds International Conference on 2 October 2015 in the Grand Auditorium of the Bibliothèque nationale de France. This one-day conference celebrates Europeana Sounds, a ground-breaking project of the European Commission and the Europeana Sounds Consortium to provide access to Europe's sound heritage. IASA is excited to collaborate with this important event.